Item is a photograph of an oil painting by Canadian war artist Lieutenant (later Captain) George D. Pepper. The scene is of troops of the Royal Highlanders of Canada (The Black Watch) lowering six PDR anti-tank guns into storm boats at Burton-upon-Strather, North Lincolnshire, England. The photographs were sent to Brigadier Sherwood Lett from England to his Vancouver address in September 1944. Typed on paper affixed to verso: "Ser. No. 2053 TITLE FOR PUBLICATION / 'LOWERING ANTI-TANK GUNS INTO STORM BOATS' / Royal Highlanders of Canada (The Black Watch) / England. 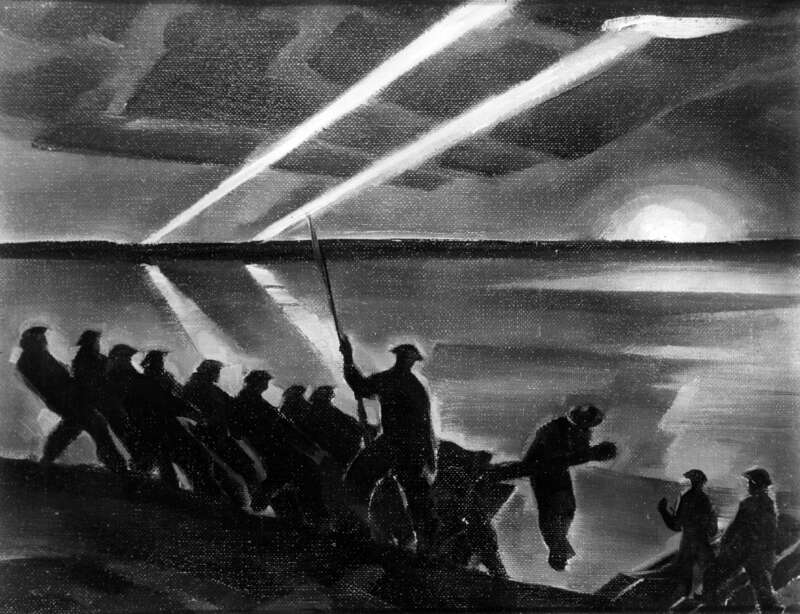 May, 1944 / From an oil painting by / Lieut. G.D. Pepper / Neg No. WA 367" and on a second piece of paper: "Ser. No. 2053 / LOWERING 6 PDR ANTI-TANK GUN / INTO STORM BOATS / Royal Highlanders of Canada. / (The Black Watch) Burton Stather / Lincs, England / PEPPER / NEG NO WA 367".